The red lion’s roar converts to speech from the woman’s hips and womb, to sing the Holy Names and archangels of the compass. The red lion is the raw passionate nature. The woman gently stretches his mouth open. The gesture is the whole expression of the Great Work. It does not prohibit. It guides and it delivers, according to nature. The two little trees in the landscape indicate a brook – running water. There is no blue colour in this Key, because the content suggests the surfaced subconscious so totally. Through the manifest and the latent, flows the inherent polarity of all life and consciousness, a movement through the tao of substance and the virtual sea. So the content of this Key is saturated with the Priestess (Isis) – like closing your eyes to the colour red and seeing green. 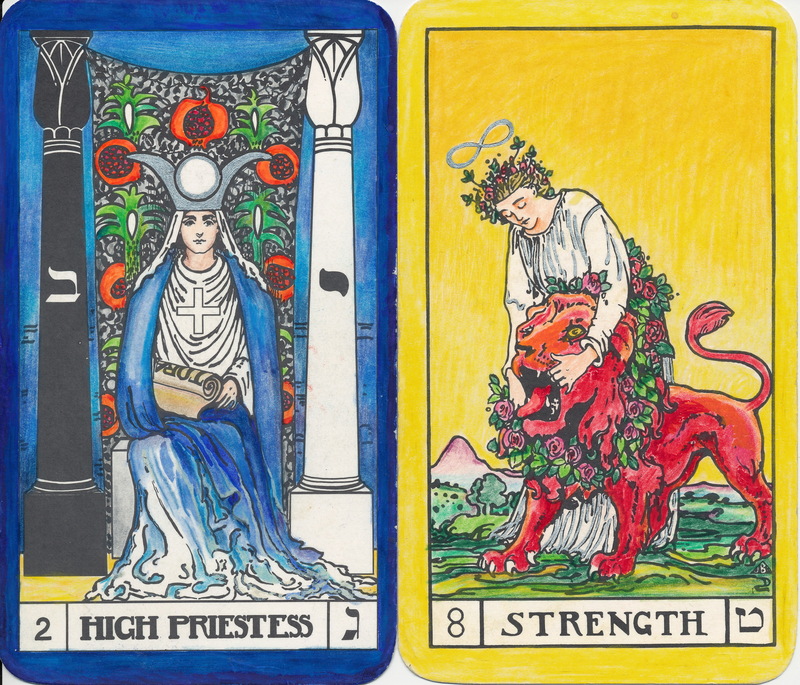 Consider then – (a fresh thought) – Strength and The Priestess together, as complementary, and how they express and are the Fountain. 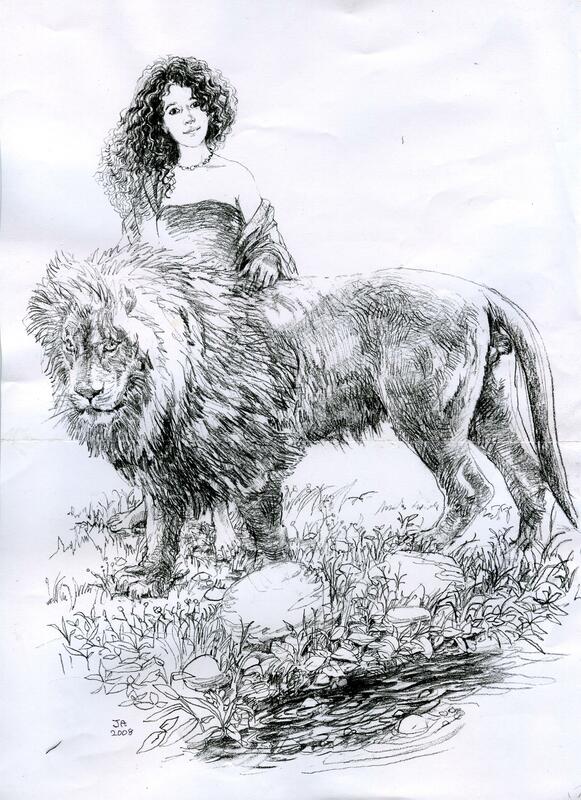 The Lion’s front feet/her feet root the Kundalini (which also waves in the lion’s tail) right up through her combined head/his body beauty & the beast to the gentle curve of her attention, and the flowers that grow briskly from her hair into a lemniscate. Her left hand pulls his upper mouth back, her right hand presses down his lower jaw, for him to give tongue. Now I feel their physical and psychic unity in and of the landscape, like an asana. Hear within, the roar of the hermetic lion. The roses and leaves around his neck, yoke him by figure of eight wreath to the woman. The colours are Mars and Venus: the desire nature. The Priestess simply sits, with her rolled up Tora scroll – the akashic record of all time – unravelling a tiny bit: the pomegranates glow behind her. The Tree of Life is a fountain. Those pomegranates are the red lion’s roar around and through her – like the upraised cobra behind some Indian deities. She is shekhinah, the veil of the sanctuary; and from her lap the river flows. Solomon’s white and black pillars indicate the chequered pavement, the trestleboard. The trestleboard is the ground-bass, the masons’ grid from which the Pattern rises – like the gothic arch from vesica pisces. 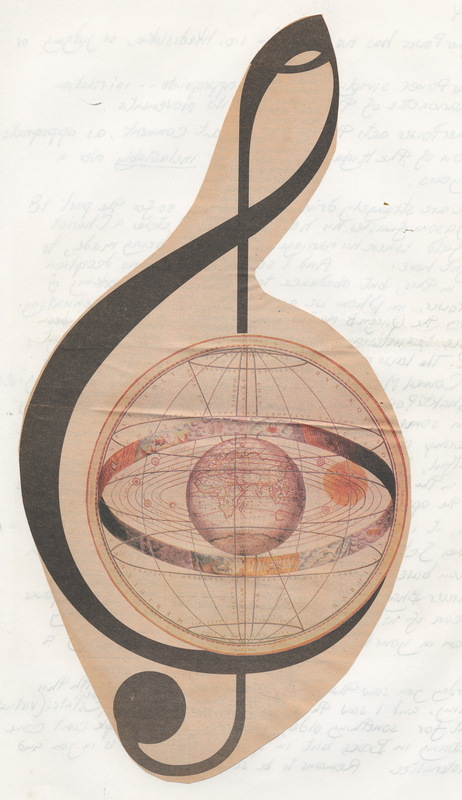 The Pattern is the way of life – the signature of nature, as in the fibernacci series – the pattern of dance, of Karmic activity or sacred speech. Paul Foster Case wrote in The Tarot – a Key to the Wisdom of the Ages: “Our mental patterns are determined by self conscious interpretation of experience. Let observation and attention (the Magician) be faulty, superficial, negative or fearful, and the resulting sequence of subconscious reactions is bound to be destructive. Then the spoken word and unuttered speech of thought (the Chariot) will be vehicles for a destructive pattern, and we shall set wild beasts at our own vitals. Prana is not the breath, but the electro magnetic vitality the breath draws in and out: the particle where breath is consciousness. Consciousness is the universal cosmic pattern, in human, animal, plant and mineral, as in the intergalactic space. So this Key is called the Secret of the Works. It is the little place behind the garden, where the gardener keeps the tools, trowels and cuttings that are coming along. The Priestess in her blues is concealed in the little valley by the trees (just below the violet mountain in the Key); where water flows. Pure Consciousness (white) turns blue (subconsciousness) and also green (fertile) and red-orange (the Sun) – what a flower. The pillars are lotus buds. She is in bud. Mother Isis is furled in bud. This Key’s ruler is the Moon. When the egg is fertilized, the sperm dissolves to the embryonic feminine matrix (mater, material, la mer) from which after conception, the gender will differentiate to male or female. The man inseminates, but the woman broods, creationally. Genesis says HASHEM breathed onto the waters to differentiate them – above, below. It suggests the waters – the Woman – were there before God’s outbreath. HASHEM (means Lord, or God’s Name) breathes Yod (father) as Heh (mother) into Vav – ADAMAH (clay or earth – the child). The second Heh gestates a new Yod or family. And thus, the tetragrammaton cycles of life – the prana, in and out. As Eve was fashioned from Adam’s rib, she originally lay closer to him than breathing, until he came to recognise her. HASHEM “fashioned” and showed him. And so the molecule forms. The universal atom of HASHEM is feminine-receptive. There is a sleepy rumour in my family tree, that our German great-grandmother is descended from the artist Lucas Cranach. Cranach painted character portraits, beautiful studies from nature, and old men lusting luscious young women. Another branch from his seed twigged out eventually to Goethe, and who knows where else? Be that as it may. Rhyzomes and root systems are threaded through the ground of being: turn over any spadeful of the ground, and see … we are all connected, eye to you. 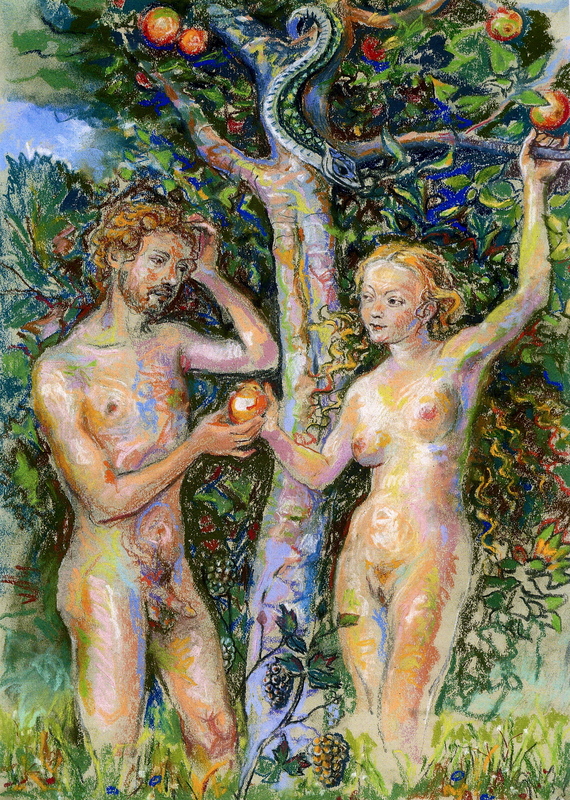 In this painting, after the famous one by Cranach, Adam is a puzzled scientist with Eve’s offering. These ideas arose from the monthly meeting of BOTA London group; we studied Key 8 yesterday. Many Tarot decks (The Sacred India Tarot, for example) have Strength at 11 and Justice at 8, the other way round. For meditation and divination, this does not really matter; there are cultural subtleties. The two Keys uphold equilibrium, and there is much to be said for both versions. 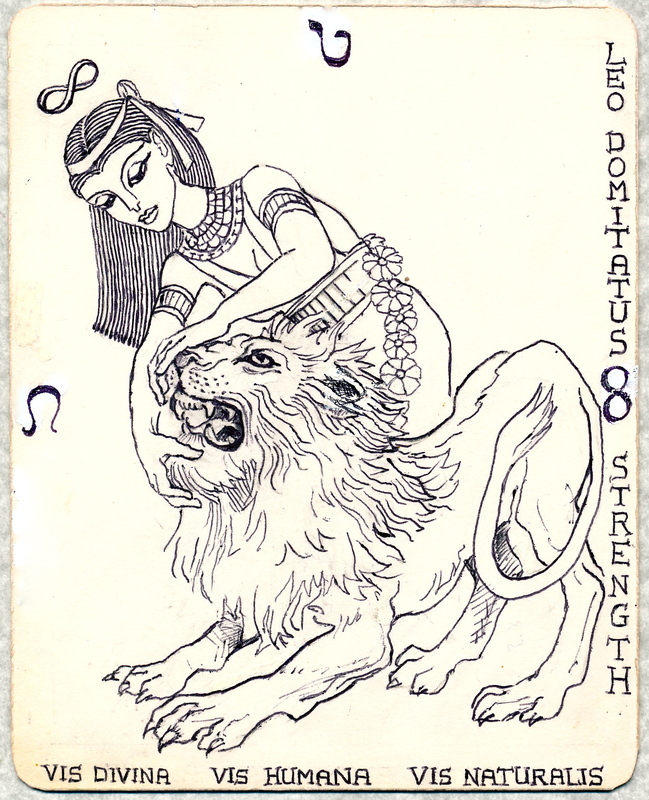 For a Kabbalah based deck, the Lion at 8 fits the symbolism (Leo) of the Hebrew letter TETh. The TETh’s hieroglyph or sign is a half coiled snake, the visual echo in the lion’s tail. 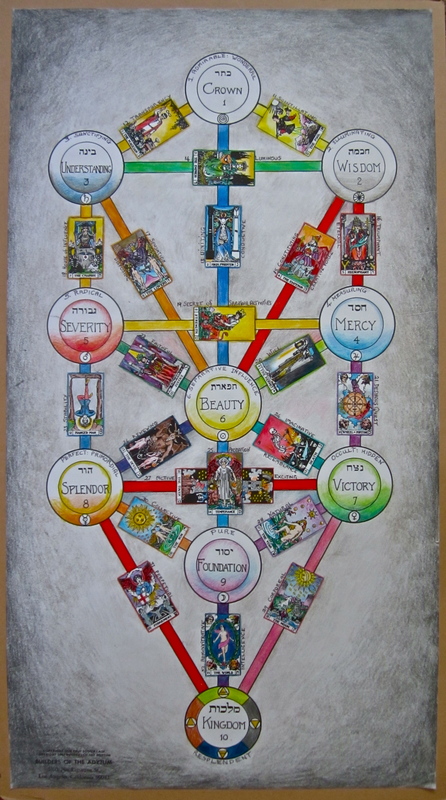 Finally, here is the Tree of Life, with the 22 Tarot Keys – the Hebrew alphabet – positioned on the 22 paths down the lightning flash. This entry was posted in journal, Kabbalah & Vedanta, snake water stone river and tagged Alchemy, Aryayogi, Builders of the Adytum Tarot, fohat, isis, Kabbalahsociety, kundalini shakti & kabbalah, path of the lion, Strength, strength & justice, tetragrammaton, The Sacred India Tarot, The Tree of Life, trestleboard by janeadamsart. Bookmark the permalink. Absolutely fascinating with wonderful drawings ! I adore your blog. It is filled with such lovely images and ideas. Visiting is often a very meditative experience for me. Am I correct that the black and white pencil drawing of Key 8 (above the B.O.T.A. version) is your artwork? It is a lovely image. 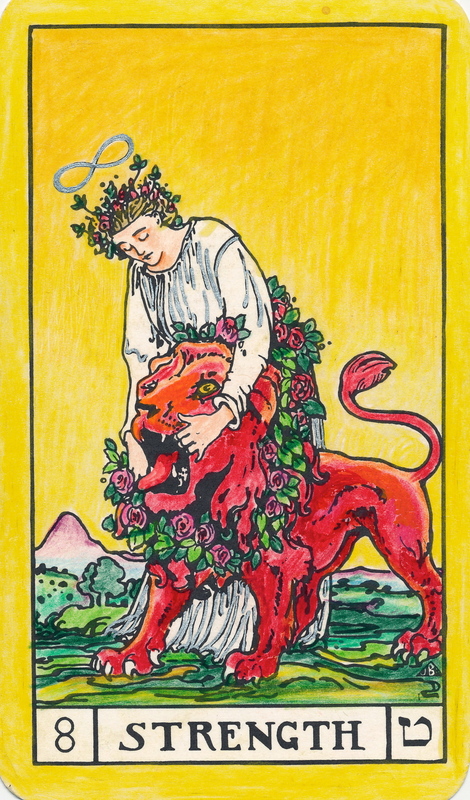 I just wanted to point out that in the esoteric deck the position of the Lion’s feet should form an upside-down Shin. You can see this clearly in Key 8 of JBP’s Builders of the Adytum deck. May Light be extended upon you. Dear Frater Kevin, thank you for your comment – Yes, that drawing was before I started studying B.O.T.A. Thank you so much for pointing out the upside down Shin. I had never noticed this before! It throws yet more light into this wonderful Key. I love your writings and always look forward to a new post. I have been in B.O.T.A. lessons for three years with numerous tarot studies and a major Dark Night of the Saturn’s Return Soul experience years ago. But my sepent Kundalini fire has been on low for many years but was just ignited a few weeks ago. I have been trying to make sense of it. When I was younger when it was ignited it actually burnt me in horrible ways. And while I have been looking at those old patterns I knew that this opening is not a random act. Some one I was talking to yesterday called it “lust” which immediately lit up Crowley’s card in my mind which flipped me over to the B.O.T.A strength card. Looking up kundalini and B.O.T.A brought me to your post (and I am one of your subscribers already, lol). I know I have different tools now to direct this energy. I actually see this energy in the cards but only traced it back to the lovers card. Thank you for showing me the true source from which it flows, the High Priestess Card. Such a beautiful life I have. Thank you! 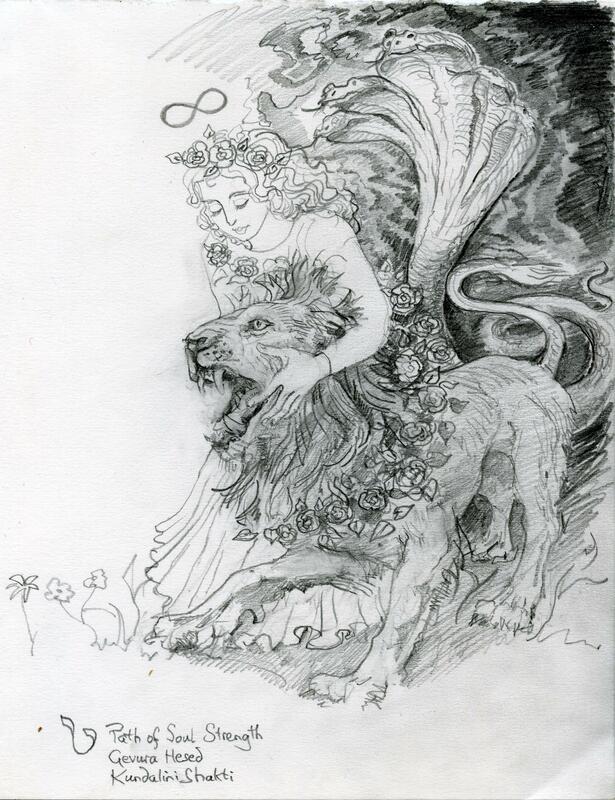 Lovely to hear from you, and I wish you all the loveliest waters in the Priestess stream for this new year. The B O T A lovers card has a beautiful balanced transmission, so has the Strength. Keep it simmering, not too hot, give it time and love and generosity – and stay cool – and it will cook just fine!